Drummer, percussionist, composer, and educator Evan Hyde is a sensitive and versatile musician with extensive experience performing in a wide spectrum of styles and genres. Hyde began his career in 2004 in his hometown of Grand Rapids, MI, where he began working as a freelance percussionist during high school. 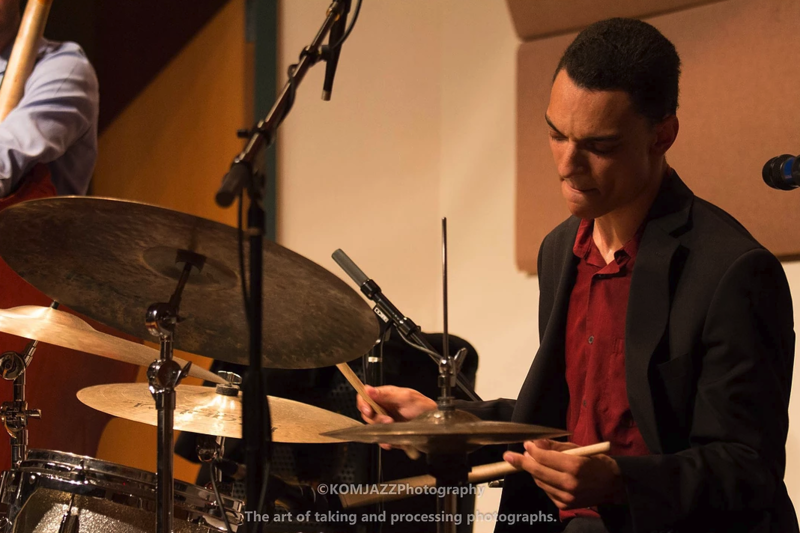 Evan has since become a high in-demand jazz drummer throughout the United States and abroad. Evan has performed with a veritable “who’s who” in the jazz world, with recent collaborations including George Coleman, Freddy Cole, Russell Malone, Helen Sung, Stanley Jordan, Shelly Berg, Kenny Barron, Cheryl Bentyne, John Daversa, Brian Lynch, Ira Sullivan, Fred Hersch and Take 6. Hyde’s pursuits as a composer and a bandleader have also earned recognition. He was competitively selected to be a member of the 2015 class of Betty Carter’s ‘Jazz Ahead’ artist-in-residence program at the Kennedy Center in Washington D.C., as well as the 2016 International Workshop in Jazz & Creative Music at the Banff Centre in Alberta, Canada. Hyde has also been recognized by Downbeat Magazine’s annual Student Music Awards with his band, the Evan Hyde Group, winning the graduate small jazz combo category in 2016 and receiving an outstanding small group composition award for his original composition “Depredation”, also in 2016. Additionally, Hyde received honorable mention in the ASCAP Foundation’s 2018 Herb Alpert Young Jazz Composer Awards. Hyde completed his undergraduate studies in music at Western Michigan University, where he studied with Keith Hall and jazz legend Billy Hart. He then went on to study with drummer Bill Goodwin and pianist Mulgrew Miller at William Paterson University for one year before choosing to continue his graduate studies at University of Miami’s Frost School of Music. At the Frost School, Evan studied with Steve Rucker and Terence Blanchard, and he was also appointed a fellow of the prestigious Henry Mancini Institute. Evan received his Master of Music degree in Studio Music & Jazz from the University of Miami, and he is currently based in New York City.